The dump tool tool provided by H2O Consulting is also useful to display the XML representation of the HTTP request which is sent to the XSLT, XQuery and XProc components in a web application. Servlex is a container for EXPath Web Applications (or webapps for short). It enables you to install and run such webapps, written in XML technologies (using XQuery, XSLT and/or XProc components). Servlex handles all the networking, and connects the components to the HTTP layer. 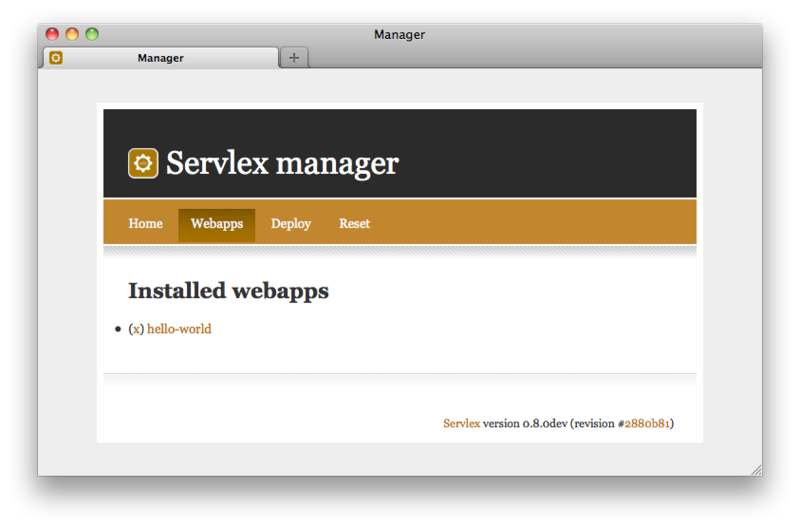 Day-to-day, the way you will interact most with Servlex is via the Webapp Manager and/or the REST API. The purpose of the Webapp Manager is to, well, let you manager webapps. The Webapp Manager is itself a webapp. It is not built-in Servlex, but uses its APIs to present the user with a web interface. Because the Webapp Manager is itself a webapp, it needs to be installed before you can use it. If you used the Servlex Installer, bundled with Apache Tomcat, then the Webapp Manager is already pre-installed and configured in the repository created during the installation. Details are convered in the Installation Guide. You can access the Servlex Admin Console at http://localhost:19757/manager/. The Console lets you manage the webapps in a Servlex instance, by listing them, removing them, deploying a webapp from a XAW file, or directly from CXAN. If you are eager to test Servlex, you can deploy the sample web application available in the installation dir, as hello-world-n.n-n.xaw. Go to the Console, to the "Deploy" tab, fill in the form by choosing the file and press deploy. Check the abstract you get on the next page looks OK, keep the default context root suggested, and press deploy again. You can now access the example application by visiting http://localhost:19757/hello-world/. The sources are available in the dir hello-world/ in the installation dir. This sample application is just a few forms, each one-field, sending a string to either an XSLT function, an XQuery function or an XProc step, which in turn responds with a page based on this parameter. A new REST endpoint will be added, to remove libraries and webapps once they have been installed.